For some of us breaking into the housing market can be a difficult task especially given how house prices are falling and lenders are more reluctant to grant mortgages following the so-called ‘credit crunch’. With this in mind we look at Shared Ownership Homes, a way in which to own part of a home – at least initially - and get a foothold on the property ladder. Shared Ownership is when two or more people own a home and have applied for a mortgage together. Mostly shared ownership is two people, usually partners, who have applied for a mortgage to buy the property together on the understanding that if one or the other decides to sell then he or she must seek the approval of the other partner and also must give them first refusal on the purchasing of their half. Many mortgage lenders favour joint applications for a mortgage as this spreads the risk should anything go wrong. However you must still go through the procedures of applying for a mortgage in the same way if you were applying as a single mortgage borrower. When applying for any mortgage the mortgage lender will ask for details of your expenditure i.e. : how much money do you have coming in jointly, how much money is going out, do you have any adverse credit and are you both in full time employment? If either one of you is unemployed then this may cause a problem and the mortgage lender may suggest a single applicant mortgage. However if you are both in full time employment and have no adverse credit the likelihood of your being accepted for a mortgage is greatly increased. 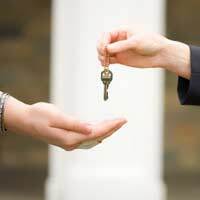 Buying a house together can be as daunting as if you were buying a house on your own so it is important to take all important decisions together and to be in agreement. If you both cannot agree on a way forward then it is best to go back to the drawing board as it were and try to come up with other solutions. It is important to consider how stressful buying a house can be and whether or not it is something you really want to do. If you need advice and support, especially where mortgages are concerned, it may be worth employing the services of a solicitor or financial advisor who specialises in such things. He or she can help you with your mortgage application and also with the exchanging and signing of contracts. If you and your partner have shared a Housing Association or council home together then you may be eligible to buy the property if you have resided there for five years or more. You will be notified by the Housing Association or council if you have lived in the property for five years or alternatively you can apply in the last six months of year four of your tenancy. Again it is worth noting that if you cannot afford the buy the property outright you may be able to enter into a Rent to Buy scheme; this means that as partners you can purchase one half and rent the other whilst trying to raise the capital to buy the other half as well. As always it is a good idea to consult with a financial advisor or solicitor specialising in house buying before entering into any mortgage agreements. You should spend time considering all of your options before making a final decision and it is important also to take the time to consider your finances carefully before applying for a mortgage. Hi we are wanting to move from our shared ownership property to another shared ownership but i can't go on the mortgage due to bad credit etc, would my husband still be able to apply for a shared ownership property as a single applicant? with the housing association? I work as a sixth form study supervisor in a college , it's part time am I entitled to part ownership under key worker scheme. I own 25% of the property I saved some deposit and I am planning to buy a house with my friend but still keep share ownership property. Is that allowed? If I try to buy the 25% Equity in a shared ownership flat valued at £165k are the following costs likely to be incurred : My legal fees The Housing association legal fees Other HA fees What other costs are likely to be incurred ? How long is it likely to take ? We are a general advice page, so do not have this information. However, you can find your local help to buy agent via the link here. Titch - what a load of old rubbish.I currently live in a shared ownership property which I bought as a first time buyer and have lived there for 12 years.I put down a deposit of £5k and am now selling my house and will hopefully come out with £20k so there is lots of scope to move on. Clarkey - The monthly rent will be stated in by the housing association for the remaining share.For instance my rent for the 50% is £150/month but I know if I bought the other 50% share I could rent the house out for £500/month.So the rent on the 50% I do not own is £100 a month cheaper than if I were to rent a house of this type outright. I can't praise shared ownership houses enough.I was desperate to get on the housing ladder and this was the only way I could afford it.Now I am in the position where I can buy the rest or move on to another property where I can buy the 100%.Shared ownership gets a lot of bad press which really isn't fair mainly because people don't understand it and don't see the real benefits of it.I would highly recommend buying one if you want to get on the housing ladder and are struggling to afford a full mortgage. hi, i am buying a shared property on my own but still having my husband living with me i was just wondering what happens to the monthly rent i will be paying does it reduce the remaining half? Those with low equity or first time buyersand especially pensioners thinking of using the shared equity scheme. BEWARE. Once you have paid your money into shared equity you will never be able to move again . Like many others you will be imprisoned in your own home for ever. Low equity will only allow you to move into another shared equity propertybut no other council in the country will let you in without local connection. This restricts movement, is cruel and unfair. Think very carefully before taking shared equity.